Solar bird baths are a great alternative to standard electric bird baths or the simple you-fill, standing water bird baths. They save electricity which is good for the environment and your wallet and provide clean, running water that attracts more birds. 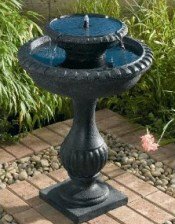 Below are some favorite bird baths and fountains among bird watchers. The only disadvantages of a solar vs. an electric powered bath or fountain is that it requires direct sunlight and may not be as powerful, however it is less noisy, more peaceful and for those reasons is preferred. See the Wishing Well Bath below. No wiring, no operating costs, simply install, add water and enjoy! How does a solar bird bath work? A solar powered panel that either is placed inside the basin of the bird bath or a panel that lays just outside the baths collects solar energy from the sun during the day. That energy will power the pump to keep the bird bath water circulated. 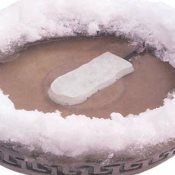 Some solar powered bird baths can be damaged by cold weather, so during the winter months you may need to remove the solar insert and/or use it in conjunction with a bird bath heater that keeps the water and unit warm. Again, on cloudy days, there are those units that also feature an electric option for plug-in power like the one featured below. The Wishing Well Solar Water Fountain is a nice choice because you have the electric option on cloudy days. "I have had several other solar fountains and have found this one the best thus far. Trickling sounds is very nice and attracts plenty of birds. I am thinking of getting a second one to go in my front flower bed, also. 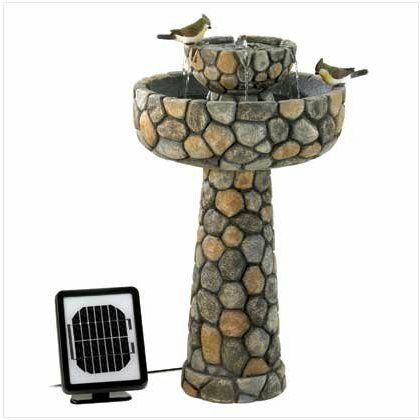 Alternatively, you can use an existing bird bath - or really any type of basin - and convert it into a solar bird bath fountain by just using an inexpensive ($15-$40) solar panel and pump kit. Watch the video below for this DIY option. 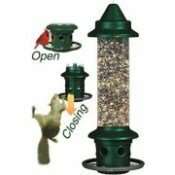 Bird Bath Heater - Keep your bird baths ice-free during the winter.